With a swing step furiousness that can’t help but evoke imagery of soldiers marching into battle, Jupiter in Velvet’s “Can’t Get It Right” starts walking us down an ominous path from the get-go. Jupiter himself struts with a stone cold, ominous demeanor among one heart stopping guitar riff after another in a layered sonic cataclysm that pushes us to question our own definition of melody. There’s so much rock n’ roll swagger steaming off of the amplifiers that one can easily feel suffocated by its thick, heavy basslines and cutting vocals, but it’s just a taste of what’s in store for those who listen to Beautiful New Day, Jupiter in Velvet’s latest slice of musical thunder and arguably his best yet. The first time that I listened to it all the way through with nothing to interrupt or distract me, New Beautiful Day gave me the chills. They were the same kind of chills that I feel when I’m listening to “Kashmir” or “I Wanna Be Your Dog;” I’m in the presence of rarified air, a level of talent that only comes around once in a great while, and I am powerless but to become completely captivated by every note and gripping lyric that is fired in my direction. 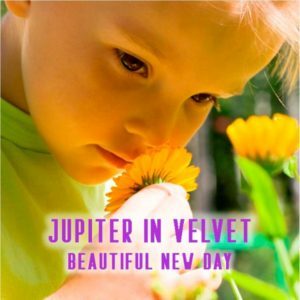 Jupiter in Velvet might not be a household name for most music fans, but it only takes one focused listen to New Beautiful Day to really wonder why he isn’t being heralded by everyone from Rolling Stone to Pitchfork as the most intriguing figure in modern rock music. Jupiter in Velvet’s vocals intermesh with the instruments so perfectly in this record that there are times when I even question if I’m listening to someone singing or if it’s in fact just another howling guitar ripping away at my heart with the same relentless hunger as a rabid wolf desperate for food in the dead of winter. I’ve never considered myself to be the biggest fan of contemporary rock music post-2000, but there’s something certifiably magical about Beautiful New Day that requires me to discuss it as a music critic and study it intently as a music enthusiast. I don’t remember the last time I said that about a rock album, let alone one that was released in the last 15 years. If you’re a fan of puritan rock n’ roll as it was originally meant to be heard; loud, proud and full of vibrancy, then you’re going to fall in love with Jupiter in Velvet’s awesome achievement in Beautiful New Day. Autumn is always a hot season for heavy music, and this could be the record that sets the tone for the entire scene and beyond. I can’t wait to hear what he comes up with next, especially if it involves expanding on the brilliant template he’s set forth in this immaculately produced, composed and arranged LP. There’s no room for debate; Beautiful New Day is the premier rock release of 2018, and his competition are going to have to work pretty hard if they want to keep up in the next year. Next Next post: Where Should You Position Your Audio Monitors?